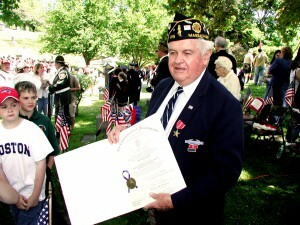 NORTH ANDOVER– On the morning of June 6, 1944, the Allies finally began the liberation of Europe from the Nazi nightmare. Tens of thousands of American, British, and Canadian troops poured onto the shores of Normandy to engage the Germans and drive them out of France. The Allies had trouble at first fighting through the treacherous French hedgerows, but by late fall General Eisenhower’s armies were nearing the German border. As the Americans advanced, Pfc. Jim Cassidy and his machine gun squad were attempting to enter a Rhineland town when almost immediately they were pinned down by a German sniper perched in the church steeple. There was little they could do as they hunkered down in their foxholes to avoid the bullets whizzing by. Finally, late in the day, supporting artillery moved up and demolished the church. Once again, the squad, as they had so many times before, picked up their gear and pushed forward with the rest of their unit during that miserable winter of 1944-45. Jim was born in 1926 and grew up in Worcester. He vividly remembers the day World War II began. On the evening of December 7, 1941, he and his brother Bill were on their way home from the movies. Jim noticed that there was a lot of talk on the trolley car about the Japanese bombing of Pearl Harbor and some women were crying. The brothers didn’t know what or where Pearl Harbor was, but they knew that the news was bad. The next day the Cassidy family heard over the parlor’s Philco radio that the country was at war. When Jim turned 17, he tried to enlist in the Navy but was turned away because of a minor vision problem. So he returned to Worcester South High School for his senior year. He graduated early, in February of 1944, and shortly after his 18th birthday was drafted into the Army. He remembers that his mother, Grace, went to pick up his diploma later that spring in the high school gym and she remarked on how many empty seats there were for those who had already gone into the service. On May 15, 1944 Jim reported to Ft. Devens in Ayer for induction. The Army then shipped him to Ft. McClellan, Ala. for 17 weeks of infantry training in the tropical heat of summer. Then Jim was sent to Ft. Leonard Wood in Missouri for additional training and, after a short leave at home, was ordered to Camp Myles Standish where he arrived in a blinding snowstorm. This was his final stop before “shipping out” to Europe. At this point, Jim was assigned to the 70th Infantry Division, famously known as the Trailblazers. For all this, Jim was paid $30/month. In November 1944 Jim Cassidy boarded the SS Mariposa troop ship in Boston and headed to Marseilles, France. The trip over was uneventful, but Jim remembers well his arrival on December 10th. There was mud everywhere and it was cold. He pitched his tent in the ever-present mud and awaited orders to the front. That didn’t take long. Ten days later he and the other troops were loaded onto cattle cars and started towards Brumath, France. Five hundred miles later they arrived at their destination on Christmas Eve. Jim remembers the next day, Christmas 1944, very well. He went to open his C rations for dinner and found them full of ice. At this point, Jim had been assigned to Company H, 274th Regiment of the 70th Division, 7th Army. Company H carried heavy weapons to support the infantry, primarily machine guns and mortars. 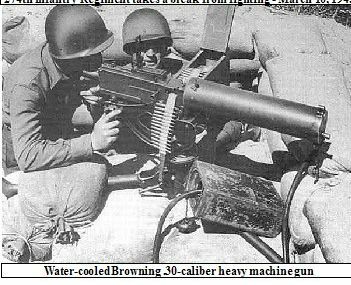 Jim was part of a “machine gun squad,” an eight-man unit operating the water-cooled Browning .30-caliber machine gun. The unit consisted of a #1 Gunner, who carried the heavy support tripod, the #2 Gunner who carried the machine gun itself, and six ammo carriers who each hauled two boxes of the 250-round cartridge belts. Jim began as an ammo carrier but quickly moved up to Gunner as other squad members became casualties. Promotion during the war was as likely to be based on survival as it was on battlefield prowess. The 274th Division fought just south of Patton’s 3rd Army during Hitler’s last-gasp Panzer attack in the Battle of the Bulge. As Jim and his Division moved forward from France into Germany, they endured constant shelling and sniper fire. They lived in foxholes in what was one of the coldest winters that Europe had seen in many years. Jim remembers carrying extra socks and innersoles in his parka to keep his feet dry. Dry feet were important because it meant warm feet and no frostbite. Perhaps Jim’s closest brush with death came when a “screaming meemie,” the nickname for a German 88 mm rocket or artillery shell, landed no more than ten feet from his position. Fortunately, it was a dud and did nothing more than to spray him with lots of dirt and debris. Did I mention that it also scared the hell out of him? As the 274th fought its way into Germany, Jim recalls that his unit was pulled back every so often and allowed a one-minute hot shower, given clean underwear and served some hot meals. One time Jim was even given a 3-day pass to Paris. It was the first time he had seen electricity since leaving Marseilles. Jim also remembers sending V-mail back home. “V” stands for victory and the mail itself might be called the predecessor of today’s e-mail. The soldier would write his letter on a special form and the Army would then shrink it onto microfilm for transport back to the states. There the letters would be restored to actual size and sent on to the intended recipients. 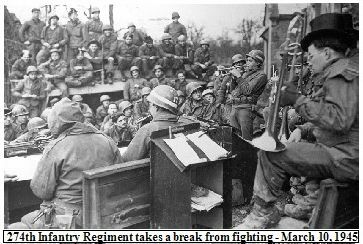 Despite the primitive conditions, the troops were kept up to date on the news by the Armed Forces Radio and Stars and Stripes. Jim remembers the sad day when their Commander in Chief, President Roosevelt, died. As the war wound down in the spring of 1945 and Germany’s surrender was near, Jim recalls the 274th taking many prisoners. A substantial number were no more than 12-13 years old as the German Army had exhausted its supply of regular troops. After the Germans had surrendered to the Allies, Jim and the 274th started planning to go to the Pacific for one more battle. This was for the invasion of Japan where Jim knew the casualties would be very high. He was still in Europe when the atomic bombs were dropped on Hiroshima and Nagasaki and he remembers the jubilation and relief of the troops when Japan surrendered. Instead of one more battle to fight, thankfully, they would be going home. In early January of 1946, Jim boarded the Liberty Ship SS John Holland for New York. He had been in Europe for 13 months and was eager to get back to the states. He will always remember that wonderful site of the Statue of Liberty as his ship made its way into New York harbor. On May 1, 1946 Jim was discharged from the Army. After the war, Jim used the GI Bill to attend UMass at the Ft. Devens campus. He studied agriculture and, after graduation, went on to a distinguished career with the Massachusetts Department of Agriculture. For 37 years he was the state’s Director of the Bureau of Farm Products and enforced the regulations on all fruits and vegetables. He even had a long running and popular gardening program with a Boston radio station. On July 4th, 1947 Jim met his future wife, Lorraine, while on an outing at Hampton Beach. They were married in 1950 and in 1954 moved from the Tower Hill section of Lawrence to a home on Perry Street in North Andover. They lived there until 2005 when they decided to move into a townhouse just across the line in Bradford. Sadly, Lorraine passed away this last year after a sudden illness. 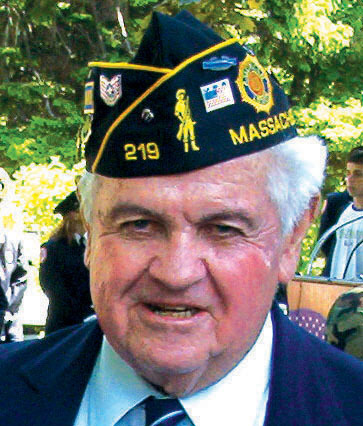 Jim Cassidy is perhaps best known for his efforts to help veterans and seniors, and promote the American spirit. 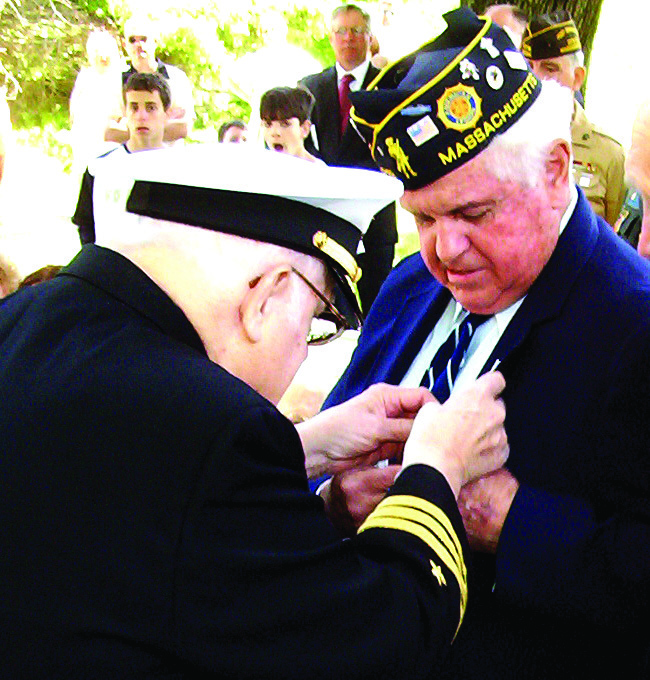 He is past commander and current vice commander of American Legion Post 219 in North Andover and a member of VFW Post 2104. After the 9/11 terrorist attack, Jim also helped champion the effort to get the American flag painted on the Bradford Street water tower in North Andover. As many of you know, until recently Jim was a regular contributor to The Valley Patriot with his column on “Senior Moments.” He always had great stories to share with us and wanted to pass along his famous “lessons on life.” We are all appreciative for having the opportunity to read them. Jim Cassidy, we thank you for your service to our country. Editor’s Note: Jim Cassidy was featured as this paper’s first Valley Patriot of the Month in March 2004. However, at that time stories were not included with the veteran’s picture. This month’s column finally shows why he so richly deserved our prior acknowledgement.